Minnesota, known for its numerous lakes, now has a space-based analog on Saturn's moon, Titan. Images captured on July 22 by NASA's Cassini spacecraft during its first flyby of Titan's north pole revealed a landscape littered with dozens of lakes  possibly filled with liquid methane  which could help solve the long-running mystery about Titan's missing source of atmospheric methane. Planetary scientists discovered dozens of lakes, some connected by river-like channels, at Titan's north pole. Researchers suggest that the lakes could hold enough liquid methane to resupply the Saturnian moon's atmosphere with methane gas. Image is courtesy of NASA/JPL. Prior to Cassini's arrival at Saturn and its moons in July 2004, researchers on Earth measured nearly steady levels of methane gas in Titan's atmosphere. They knew that ultraviolet light in the atmosphere breaks down the gas and strips it away, so they concluded that some source must exist to replenish the gas. A giant surface or subsurface methane ocean was one possible explanation, and other possibilities included methane-filled lakes or methane volcanoes. The ongoing mission has so far ruled out the presence of a widespread ocean, and until now, only one lake (about the size of Earth's Lake Ontario) at Titan's south pole had been discovered (see Geotimes online, Web Extra, July 1, 2005). That lake alone would not have been sufficient to replenish Titan's atmosphere with methane. But the newly imaged northern lakes could contain enough methane to possibly "solve that problem," says Alfred McEwen, a planetary geologist at the University of Arizona in Tucson and a Cassini imaging team member. The lakes appear on two radar images as irregular black blotches that range in size from about 1 kilometer to 32 kilometers across, according to a July 27 NASA press release. 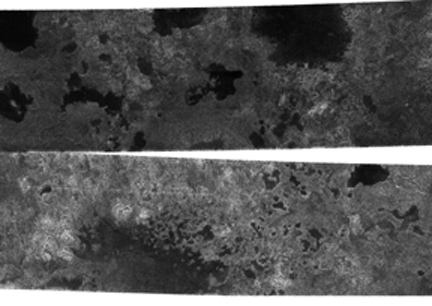 A radar device onboard the spacecraft also indicated that the lakes were almost perfectly smooth, which is "very suggestive" of liquid, says Carolyn Porco, the Cassini imaging team leader at the Space Science Institute in Boulder, Colo. That liquid, which on Titan would likely be methane, could resupply Titan's atmosphere, she says. The evidence, however, does not provide a "smoking gun," McEwen says, and it is "still an open question" as to whether the features hold liquid methane, and thus replenish Titan's atmosphere, or they are dry  leaving the source of atmospheric methane a mystery. Porco agrees, and says that the features are not "unambiguous lakes." The dark, smooth features could also result from deposited or evaporite material. The imaging team plans to look for additional lakes when Cassini next passes close to the north pole on Sept. 7, according to NASA. Researchers could also obtain additional evidence of liquid by watching to see if the lakes shrink or expand with the changing seasons. Titan's north pole is currently enveloped in late winter darkness, but the equinox will bring light there in 2009, McEwen says, adding, "I'm interested in seeing Titan through that change."